Target is known for its good deals, smart ads, friendly employees, and dazzling retail stores. 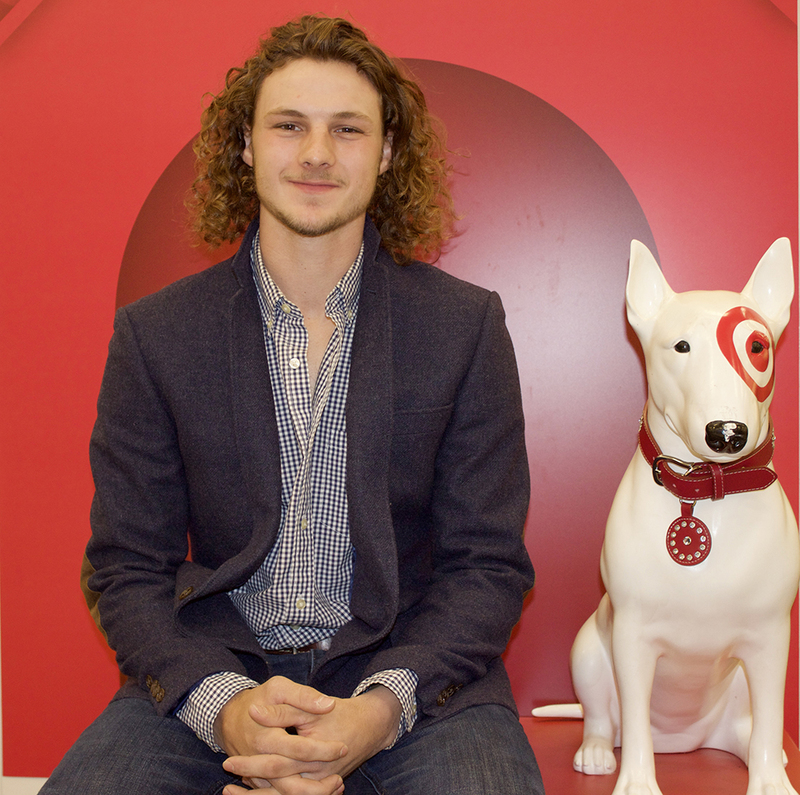 For one Saint Rose student, however, Target is more than an iconic megastore: It’s an incredible internship opportunity that allows him to apply what he’s learning in his management classes. Recently, Caleb Gregg ’19, a Management major, secured an exclusive internship opportunity at Target, where he will learn the ins and outs of running a multi-million dollar operation and have the chance to lock down a high-level (not to mention well-paying) management job right out of college. This is the first year Target Corporation partnered with The Huether School of Business to offer the Executive Team Leader Internship Program to Saint Rose students. Gregg is one of three students at Capital Region colleges to get the opportunity, surpassing 75 other area students vying for the internship. What makes Gregg a great candidate for the program? Greg Pare, a senior recruiter for Target Corporations who interviewed Gregg for the job, was initially attracted to his leadership experience as a captain of the Saint Rose baseball team. Having the ability to effectively lead is extremely valuable at Target. 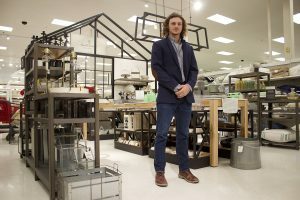 The store is structured so there are no managers, only “team leaders,” Pare said, and the goal of the program is to prepare students to manage the store on their own. Lynne Lapham, strategic relationships director and internship coordinator for the Heuther School of Business, said when she first introduced the program to students, they underestimated just how big of an opportunity the program provides. She said students thought they would spend their summers ringing up customers, which wouldn’t give them the management experience they desired. This is not that kind of internship. The Executive Team Leader Internship Program is a 10-week summer internship that teaches students everything they need to know about running a multi-million dollar operation. At the end of the internship, select students who excel at the program are offered a full-time job and a $53,000-a-year starting salary. “The goal is to convert 100 percent (of the interns) into an Executive Team Leader,” Pare said. The program is rotational, meaning students spend one week at a time learning how each department operates, including guest services, logistics, merchandise, human resources, inventory, and asset protection. The last four weeks are the most exciting and demanding, where students are expected to run the Target store on their own (with supervision). Pare recruits for Target stores in the Capital Region. However, students who wish to intern at other locations, such as New York City, Boston, Los Angeles, etc., might get the chance. Pare said he can work with other recruiters to get the students’ application into the appropriate hands. Lapham said this internship opportunity is unique to Management students because they get to learn every corner of the business opposed to just one section. Lapham, who’s coordinated the school’s internship program for two years now, understands how rare it is for students to gain the required experience needed to hit the ground running and manage a store straight out of college. Lapham was thrilled that Gregg is the first Saint Rose student selected for the program and hopes that the relationship between Target and business school continues to grow for years to come. Gregg is ready to apply his skills as a baseball team captain to his internship at Target. As a leader on the field, he’s in charge of 35 players, acting as a liaison between the coaching staff and his teammates. Gregg is also in charge of the day-to-day minutia, such as delegating who will take the equipment to and from the fields as well as who will set up and break down equipment. More importantly, he’s the guy his teammates turn to for motivation, a positive work ethic, and constructive criticism. “It is my job to be a leader through my actions, both on and off the field,” he said. Before he was a team captain for the Golden Knights, he was also a captain of the baseball team at Hudson Valley Community College. This longstanding role as a leader has helped him learn how to manage and communicate with people of all backgrounds and abilities. “When I came here, I was able to get the people to follow me and like me, and building relationships helped motivate people to do tasks and things they wouldn’t normally want to do,” Gregg said. However, there’s still room for growth. At Saint Rose, he was elected captain, which gave him the confidence to lead the team. Now, it’s time for him to gain the confidence to lead hundreds of employees. He’s looking forward to learning more about himself in a business environment versus on the field. ← Are you eligible for the NYS Enhanced Tuition Award?